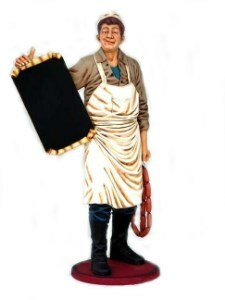 Life Size Butcher Statue with Menu Sign Chalk Board will be happy to Advertise your Daily Specials. 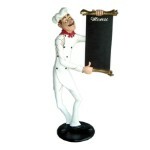 Life Size Butcher Statue holds Links of Sausage in one hand and a Large Menu Board in the other! 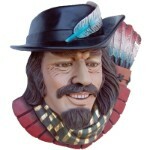 Butcher is Handcrafted of Resin, Measures Approx. 27"l x 35"w x 76"h and Weighs Approx 84 lbs. Great Display Suitable for Butcher Shops, Meat Markets, Specialty Meat Shops, Grocery Stores and perfect to use outdoors to bring in the crowd! Large Commercial, Party Themed and Event Decor! Free shipping to the lower US, although other arrangements can be made. Most items are in stock and ready to be shipped out. Limited quantity, so buy today.